For engineers to continue to navigate the uncertain waters of technological advances in broadcasting they must understand the whole business and bigger picture. But to be essential to the company and guarantee a continuous stream of steady pay checks, they must understand the problem the CEO is trying to solve. Demonstrating this, Ooyala recently wrote the Data Brief, - “Removing Growth Barriers Through Media Logistics,” which summarizes an international study to highlight and prioritize the needs of business owners, giving broadcast engineers an unprecedented inside view on how CEOs prioritize and think. 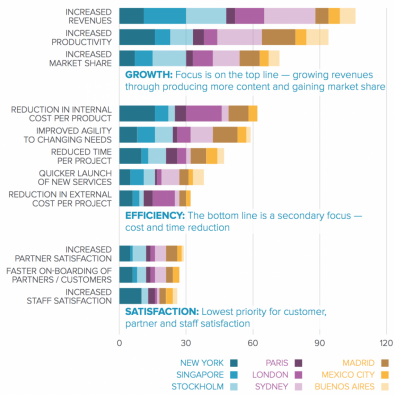 Priorities that may seem obvious to an engineer are not always so clear cut, and the following chart from the study shows the CEO’s top priorities are about improving growth and efficiencies, not customer satisfaction. Chart showing the current business priority's for CEO's. The paper discusses ways of meeting these objectives by improving efficiencies via media logistics - today's solution for advanced media supply chain management. It concludes with “The Blueprint for Success”, a two-part strategy to simplify, automate and optimize any workflow, giving streamlined benefits to meet the needs of today’s broadcasters. Averaging the costs of hardware over its useful lifetime is a practice broadcast engineers have been engaged in for many years. But with the speed viewer requirements are changing, procuring more kit with the aim of reducing costs is an oxymoron in the eyes of many CEOs. Cloud computing significantly reduces the fixed overheads of a business due to the pay-as-you-go model, meaning the business can buy new resources as it’s needed to facilitate the increased sales. In other words, the overheads are directly proportional to income. For instance, businesses no longer buy depreciating assets such as routers. The opposite is also true, should sales reduce, businesses can switch off parts of their cloud infrastructure to reduce costs without any detriment to the rest of the service. CEOs are not looking for small incremental changes to their costs. Technology changes are disruptive to a broadcaster and, to justify the interruption, the cost reductions must be massive. For instance, Ooyala’s Data Brief included a cost-benefit analysis which found one customer saw a 76% reduction in direct labor costs could be obtained through the deployment and integration of the Ooyala Flex media logistics solution. But for this to happen, a complete mindset change must occur in the broadcast center, especially with the engineers. As business sectors mature it soon becomes clear that many repetitive tasks are being completed by humans, who are particularly bad at repetition as their concentration lapses resulting in mistakes. People are much more efficient and productive, and add value to a business when they are thinking creatively. But computers continually process repetitive tasks 24/7 without error, or tiring. Media Logistics is a cloud-enabled, collaborative, automated and open approach to building united workflow systems to get content to market at a much faster pace, which also translates to higher Return on Investment (ROI). Ooyala Flex provides a framework to achieve this and helps bridge the gap between engineers and CEOs. To achieve the efficiencies CEOs are demanding, broadcast engineers must seriously look at every single process within a workflow to determine if it can be made to work more efficiently. To leverage the cost savings of cloud systems, the software supplied from the vendor must be written from the ground up. Taking existing code, executing on a standalone server, and running in Amazon Web Services, for example, is not cloud computing, it’s just a very expensive marketing ploy. Cloud servers must be capable of scaling horizontally as sales increase to meet peak demands, sometimes minute by minute. CEOs are driving their sales departments to increase purchases today, and consequently, they need to meet demands now. Clients and viewers are not going to sit around waiting. There’s nothing more infuriating than winning a big contract only to find it fails as the hardware has a six-month lead time. Next, CEOs want to increase productivity, the implication being more can be achieved for less money spent. Engineers must analyze and scrutinize every process to determine if it can be executed more efficiently. Investigations are not just limited to broadcast workflows – the whole business must be considered. Ooyala’s study shows CEOs rank media operational efficiency very high, and places a great deal of emphasis on identifying inefficiencies so they can be rectified. If a broadcaster is selling advertising space then it makes sense for the playout system to communicate effectively with the invoicing department, each time an advert is broadcast an entry on an invoice is made. 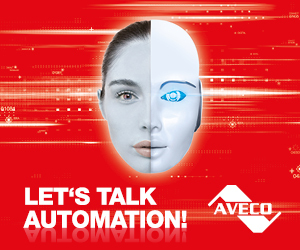 This is a completely automated process requiring no user input, resulting in massive productivity increases and cost savings. At the end of the day, CEOs want to increase their market share, or put more succinctly, increase their sales at the expense of their competitors. Broadcast engineers are in a unique position as they understand the current workflows and are at the cutting edge of technology to work out how to integrate innovative ideas into the system. Registered readers can download the White Paper at the link below.